The stepup is a great all-around exercise for the lower body. It is perfect for all exercisers since it can be modified to create a killer workout for anyone, whether you have just started exercise or have been training for years. It has a low risk of injury and, with a few adjustments, offers a good cardio workout, strength workout, or balance workout. The weighted stepup is excellent for building strength in the quadriceps muscle in the front of the thigh. Your quads get little use in level running or walking and so you may need to exercise them to keep them in balance if those are your main cardio activities. Stepups also involve the posterior chain (glutes and hamstrings). Building the quads helps protect the knee and stepups create minimal stress on the knee. This exercise is functional as people climb stairs frequently in daily life. Another bonus is that the weighted step-up exercise strengthens each leg individually, rather than as a unit. This helps ensure that you are building strength equally on each side, and not favoring one leg over the other. This exercise also improve balance, stabilization, and proprioception because you are required to control the weight as you move both up and down, and forward and backward. Stepups can be done almost anywhere since the only equipment needed is an adjustable step or bench and some weights. It is a great alternative plyometric jumping because you gain the benefit of the explosive upward movement without the impact of the landing, and to the full squat exercise because it is far easier to do correctly, and there is a lower risk of injury. Stand in front of a step or box of the selected height. Hold dumbbells in your hands or a barbell across your shoulders. Step up with the right foot, pressing through the heel to straighten your right leg. Bring the left foot to meet your right foot on top of the step. Bend your right knee and step down with the left foot. Bring the right foot down to meet the left foot on the ground. Repeat this for a specific number of repetitions, then lead with the left foot and repeat the same number of repetitions. A beginner may opt to do this for a set amount of time (one minute, for example), instead of a set number of reps.
To get the most from this exercise, avoid these errors. Protect the knee of your active leg by ensuring your knee is not angled past your toes when you step up. The work should come from the leading leg, bringing the trailing leg up as basically dead weight. Don't push up with the lower leg as this will reduce the load on the upper leg. Keep your torso as straight and upright as possible rather than rounding the back or leaning forward. Step height: The height of the step is the first variable to consider. The lower the step, the more the quadriceps are worked. The higher the step, the more the hamstrings and glutes are worked. A beginner will start with a very low step of maybe 6 to 8 inches until the movement is perfected. 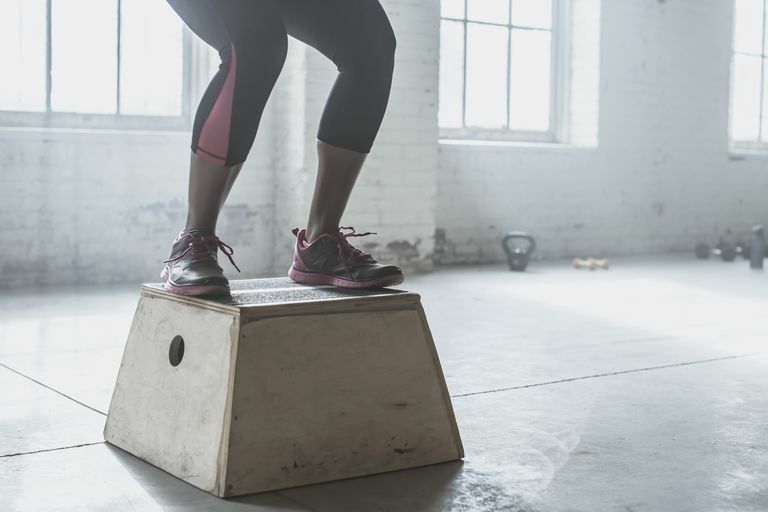 The next goal is to gradually increase the step height until it is at the level where your thigh is parallel to the ground when your foot on the step. After you can master this movement at this level, you may choose to raise the step a bit beyond this, and really work the hamstrings and glutes. Weight amount: Start with no weight and gradually add dumbbells or a barbell if you like. Using a barbell allows you to lift more, but holding dumbbells is a decent option. If your goal is to gain strength, lift more weight, go slower and perform fewer reps, eight to 12 per set. To build explosive power, or increase the cardiovascular fitness, carry less weight, go faster, and perform more repetitions such as 20 to 25 per set. Speed: The speed of the step-up movement is largely dependent upon your goals and the type of training you are doing. You can get a great cardio workout by doing stepups with no or light weights, moving faster, and performing many reps per set. As you add weight, you will probably slow down the movement (due to both safety and difficulty). Beginners should start with the unweighted stepup. This is done in the same way, but with only your body weight. It is often used in knee rehabilitation programs. Start with a lower step height of 6 to 8 inches. A beginner may opt to do this for a set amount of time (one minute, for example), instead of a set number of reps.
Once you have developed enough strength and have been able to increase the height of the step so your thigh is parallel to the ground when stepping up, you can lower the step and start with holding dumbbells in each hand. As you build strength, you can increase either the weight or the height. You can vary the step height, weight, and speed to keep challenging your muscles. There are a couple of ways to use stepups to build power. Start with one foot on the step and as you step up, propel yourself straight up off the step, and then land softly with both feet on the step. Step down and alternate which foot you lead with for repetitions. As you increase your strength and improve your technique, you can begin adding weight to the dynamic step up. Be sure to use smaller steps, lower jumps and always land softly. Talk to your doctor or physical therapist if you have had an injury or condition involving your knees, ankle, or hips to see if this exercise is appropriate for you. You will feel your muscles working during this exercise, but stop if you feel any pain.